NOTE: We’ll be driving from Subway to the Icehouse Canyon hike trail head lot. We can carpool from the meeting point. Should you need any supplies from the grocery store, please arrive earlier to do so. PARKING FEE: Adventure Pass Required. $5 Day Pass, or $30 annual Please get this ahead of time from a local Sports store like REI stores, Big 5 Sporting Goods, Sports Chalet and other retailers prior to the hike. Please try to have this prior to the day of the hike. We recommend purchasing an annual pass ($30) and a second vehicle pass for an additional $5, which totals $35 for two annual passes. You may be able to purchase at visitor center, but it’s best to purchase this ahead of time. 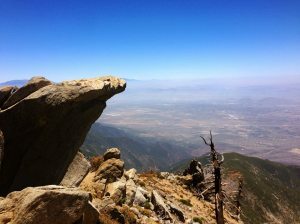 HIKE WALKTHROUGH: Cucamonga Peak is one of the highest peaks in San Gabriel Mountains and has some amazing views over Southern California’s Inland Empire. Located in the Cucamonga Wilderness in the San Bernardino National Forest. The hike is a strenuous one in which there is an approximate 4,300 feet of vertical gain with a top elevation of 8,859 feet. 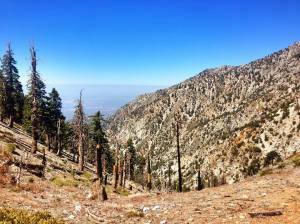 The trail to the summit begins in the Icehouse Canyon and is immensely popular leading to the Icehouse Saddle. The initial hike (ascent) and trail tends to be have a lot of foot traffic, providing some nice shady canopy in places and views of old cabins and ruins. However, there is lots of sun exposure along the way (consider sunscreen, a hat, lip balm) The second part of the hike via Cucamonga Peak trail leading to the summit is not as steep, dry, exposed and much less traveled than the latter and can sometime get windy. Once reaching the summit from atop Cucamonga Peak, you can see most of the better-known peaks in So. California including Mt. San Jacinto, Mt. San Gorgonio, and Mt. San Antonio (Mt. Baldy). This is the second of six southern California summits in what is called the 6-Pack of Peaks bundle. This is a good training for anyone preparing for more advanced hikes such as Mt. Whitney or Half Dome. Each of the 6-Pack is progressively higher in altitude, and all have respectable distance and vertical elevation gain. WATER REQUIRED. WATER CHECK WILL BE PERFORMED. If you do not take enough water or are not appropriately equipped for this hike, you will be turned away from doing this hike with us even if you show up. Please note, that we have expectations for Level 6 hikers. Read all the details. WATER (at least 3 liters). In addition, a bottle of electrolyte water, or tablets to add to a bottle of water. A small lunch to have at the top. Comfortable hiking/sports shoes with good grip (you’ll be on your feet for quite a few hours). Hiking socks to help prevent blisters. Windbreaker/Upper layer as it will get windy in some areas and at the peak, and to protect against the sun. A hat that will also cover or shade the back of your neck as sun will be a factor. A good night’s rest. Please make sure you go to sleep early as you’ll need to get up early. Should you need any supplies from the grocery store, please arrive earlier to do so. First-Aid kit. Consider band-aids and other items in case of scratches or to help prevent/ease any blisters along the way. Ankle/Knee braces. Some are prone to these issues. Please make sure you are prepared (even 99 cents store sell some). Carry some pain medication like Advil, in case you come across some major leg soreness. Trekking/Hiking Pole(s) to help you get through some rougher areas. Light colored clothes, breathable long sleeves, light-weight hiking pants. Keep your backpack with essentials. Take some additional snacks (trail mix, nuts, granola bars, fruits, etc.) to have at some designated break points. You’ll get hungry before lunch. A bag to place in trash in to help you pack it out (to put things like fruit peels, lunch trash, etc). A flashlight for visibility in case something happens and you need to extend your hike. DOG FRIENDLY? : No. Although they are allowed in the area, we are requesting NO Dogs on this level hike. DISCLAIMER: LA Trail Hikers and its Leads/Organizers/Participants do not take responsibility for any harm, bodily injury, accidents, or damage to personal property. By attending the hike, you confirming that you understand that all outdoor activity such as hiking, backpacking, and trekking have an associated danger, and will not hold any hike lead/organizer, participant, LA Trail Hikers, or any group associated pet responsible for any hazard to your well being. Additionally, you will not be allowed to participate with the group if you are not adequately prepared with enough water and the right gear/equipment/nutrition essential to complete the hike. You are fully responsible for yourself.